Often you’ll hear people discuss how difficult it can be to eat well when dining out. This is true not just for us big people, but it’s true for little people too. So today I thought I’d share some strategies for helping your little ones eat well when a restaurant controls the menu. Before I continue, I simply can’t resist the urge to get on my soapbox for a minute. And it’s my blog, darnit, so I’m climbing up! All too often I hear people say things like, “Kids don’t eat X,” where “X” is anything healthy and often something green. And I can’t help but find this a self-fulfilling prophecy: to the extent that this is true, it’s true because we make it true. When our children first start eating, they eat what we select for them. If they aren’t eating broccoli, it’s because we’re not feeding them broccoli. 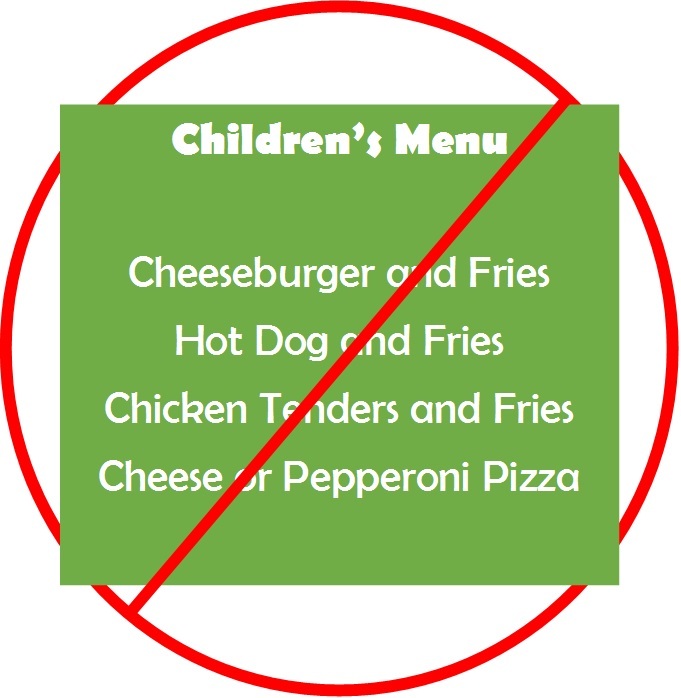 If instead we feed them items like you see on the menu above because “that’s what kids like,” then guess what? That’s what they WILL grow to like and expect. And the longer we wait to introduce healthy foods to our kids, the harder it becomes to change preferences and behavior. Growing up my conception of vegetables was limited to green beans and corn that you get from a can. And you know what? I LOVED canned green beans and corn. On the rare occasion that a fresh green bean wandered my way, I thought it tasted terrible! I have a vivid memory from childhood of eating chicken noodle soup over at a friend’s house. I was expecting Campbell’s and was hugely disappointed when my friend’s mom placed a steaming bowl of homemade soup in front of me. It had carrots in it. HUGE chunks of carrots. I tried one – the first time I think I ate a carrot. It was disgusting. Over time my eating habits improved, but it took a LONG time. At some point during college I started eating vegetables because I wanted to improve my diet. At first I didn’t like them at all; then I started to tolerate them; and eventually I started to enjoy them. Now I eat roasted Brussels sprouts like they’re candy. So change IS possible, but we don’t have to make it so hard. We can start our kids eating well when they are young. And that takes us back to the issue at hand. What do we do when menus like the one above greet us at restaurants, as they so often do? Here are five suggestions. 1. Pass on the children’s menu. The host or hostess will almost surely offer a children’s menu when you arrive. Glance it over quickly and say, “No thanks,” if it even remotely resembles the one above. 2. Share your entree with your little one. Ok, so now you’re at the table without a children’s menu, but your little one still needs to eat. Now what? For young children who don’t strongly desire their own meals, order something for yourself that you can share with your child. I often do this with my two year old, Siyona, and she’s perfectly happy to share. If you’re committed to seeing your child eat well, this can be extra motivation for you to eat well too, which sometimes we need! Plus, little kids often don’t have the appetite to eat their own meals, so you’re saving money AND avoiding waste. I die a little inside when I’m dining out and see the server clear away the hardly-touched plate from the toddler sitting at the table next to me. 3. Make healthy side dishes and appetizers your friends. For slightly older children who really want something of their own and/or for those with slightly larger appetites, order them something but not a full meal. Now that Siyona is getting a little older, I might share part of my meal with her but also order her a healthy side dish, such as sauteed vegetables or brown rice. Good choices for a healthy appetizer might be chicken satay, shrimp skewers, or tomato basil mozzarella salad. 4. Reinvent the menu. I will often ask my server to make simple modifications to the menu. You know how restaurants often have protein “add-ons” to salads, such as grilled chicken or salmon? Those make a wonderful main dish for a little one, and not once has a server declined this request. If you see avocado anywhere on the menu, you could ask for a bit of this at a small additional charge. Same goes for any fruit or vegetable you know is a hit with your child. You can create your own children’s menu by just making simple requests like these. 5. Have something in your back pocket. Or more specifically, have something in your purse or diaper bag. I will often bring something simple from home for Siyona to eat as a last resort. This is useful in cases where the menu options are SUPER scarce, if she needs a little something to fill out her meal, or if she’s just being picky. (In general, she’s a great eater, but hey, she’s still two. Give her a break). If you join me for dinner and search my bag, there’s a good chance you’ll find a bag of nuts, some raw veggie slices, plain yogurt, or my (not so) famous oatmeal (I feel like I link to this recipe in every blog post. But it’s good! I’m tellin’ ya!). The really nice thing about the nuts is that they take her forever to eat, and they don’t make a mess. In other words, they keep her entertained for a LONG time. Who needs crayons? Some restaurants ARE coming around and offering healthier options for kids, but it never ceases to amaze me how many places still list chicken tenders and fries as the featured kids’ item. And that’s in the DC-area where you might expect more enlightened thinking. But at least now you’ve got some tips to make sure your little one is eating well while we wait for the rest of the world to catch up!